From Biart, the makers of Depth Hunter comes Depth Hunter 2: Deep Dive. Explore underwater in this spear hunting adventure that gives you the opportunity to harvest a wide variety of fish species with this ancient fishing method. This is the first multiplatform game about underwater extreme sports and is complete with 25 missions and 3 gigantic locations in oceans around the world. There are coral reefs, random junk from centuries gone by, and even an airplane in these beautiful underwater scenes. Get in touch with your primitive side in this modern video game version of an ancient sport. 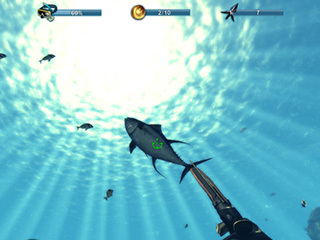 Depth Hunter 2 captures the challenge of holding your breath as you plunge under water to select the best fish to harvest. In addition to the physical challenges of holding your breath as you go further below where the water pressure is greater and shrinks your lungs, you have to hold a giant spear gun steadily and reel in your catch once you hit your target. The bigger ones will put up a fight, so it takes some time to get it down right. Lots of fun, but be sure to come up for air every now and then! The game has more than one objective, though. 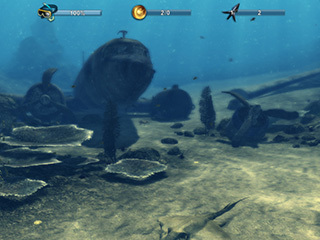 You can also collect items from the ocean floor and take pictures of the beautiful scenery. This game is challenging, but not too challenging. It’s good for all skill levels. Lots of tactics and quick thinking involved. If you like to think on your feet, well, in this case fins, then this is bound to be an exciting game for you. Two thumbs up!